With award-winning digital multimedia solutions that lead the industry in sales and technology, Nero continues to develop products that make living a digital life easy and fun. Over 240 million Nero users worldwide enjoy products and applications that integrate key technologies designed to improve the digital life. Convert your audio files with the Nero AAC Codec - FREE! Crystal-clear, award-winning sound quality at every compression ratio and bit rate! Store an entire audio album in a single .mp4 file with all the features of an Audio CD embedded inside, but at a fraction of the space! SecurDisc is the comprehensive, state-of-the-art protection solution for CDs, DVDs and Blu-ray Discs, offering multiple levels of protection for data, music, photo and video files. 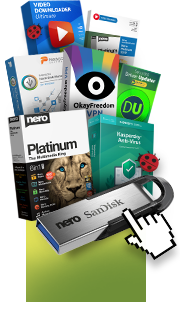 Nero products utilize SecurDisc 3.0 technology for optical disc protection to ensure disc data readability regardless of scratches, age or deterioration, advanced password and encryption protection against unauthorized access, digital signature feature to protect against content manipulation and an early disc deterioration detection feature to alert you to back up your data. Nero has teamed up with Gracenote to bring you leading audio entertainment technology for organizing your music collection. Get the most accurate, up-to-date artist, track, title and album information for more than 80 million songs on more than 60 million CDs when you rip, burn and play back your music. Nero products have integrated Gracenote music recognition technology so you can efficiently organize and enhance your music library with just a few clicks. Next-generation technology from Nero and Blu-ray Disc gives today&apos;s multimedia enthusiast the very best in cutting-edge tools. By incorporating Blu-ray Disc data and authoring support into Nero products, you&apos;ll get the most from your Blu-ray Disc players and burners when you author, edit, and burn High Definition content in Blu-ray format. Because most camcorders have AVCHD recording formats, Nero has integrated full AVCHD support into Nero products for a seamless, High Definition user experience between your camcorder and PC. Import High Definition content from your AVCHD camcorder, disc, or memory card, then edit and author your videos in highest quality AVCHD format to HDD, including USB stick and flash memory card, SD Card and Sony Memory Stick® even without the use of an optical recorder. You can also convert your existing HD content into AVCHD format to play back on PlayStation® 3 or Blu-ray Disc players. Integrated with Labelflash™, Nero products give you the tools to add the final creative touches to your CDs and DVDs. Without using printed paper labels, Labelflash™ utilizes state-of-the-art dye layer technology to quickly and directly burn labels onto discs with your own custom designs, logos, graphics and text for truly professional-looking discs. Lightscribe uses special label-making software to etch labels directly onto CDs and DVDs with laser technology. Because labels are not printed on paper, there&apos;s no smudging, peeling or waste. Nero has integrated Lightscribe into their products to give you professional-looking discs directly from your burner.